The court is based at the Lewis F. Powell Jr. United States Courthouse in Richmond, Virginia. 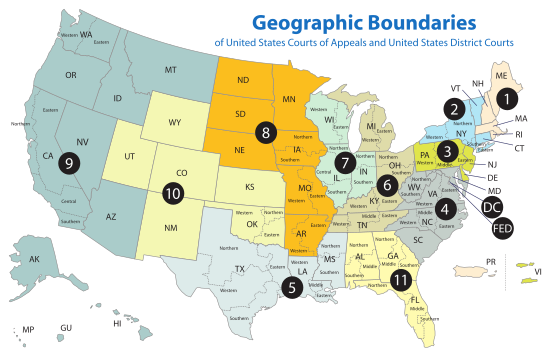 With 15 authorized judgeships, it is mid-sized among the 13 United States Courts of Appeals. ^ Recess appointment by Bill Clinton, re-appointed by George W. Bush and confirmed by the United States Senate at a later date. The court has fifteen seats for active judges, numbered in the order in which they were filled. Judges who retire into senior status remain on the bench but leave their seat vacant. That seat is filled by the next circuit judge appointed by the president. The Fourth is the most efficient circuit, taking an average of just over seven months to resolve each appeal. [clarification needed] From 2000 to 2008, the Court had the highest rate of non-publication (92%) on the Federal Circuit. The Chief Justice is always assigned to the Fourth Circuit as the circuit advisory justice, due to Richmond's close proximity to Washington, D.C. The Fourth Circuit is considered an extremely collegial court. By tradition, the Judges of the Fourth Circuit come down from the bench following each oral argument to greet the lawyers. ^ "U. S. Court of Appeals for the Fourth Circuit". Official website of the Federal Judicial Center. Retrieved February 27, 2017. ^ "Fourth Circuit Judges". Official website of the United States Court of Appeals for the Fourth Circuit. Retrieved February 27, 2017. ^ Bond was appointed as a circuit judge for the Fourth Circuit in 1870 by Ulysses S. Grant. The Judiciary Act of 1891 reassigned his seat to what is now the U.S. Court of Appeals for the Fourth Circuit. ^ "Inside the Fourth Circuit Court of Appeals: How Collegiality Works | University of Chicago Law School". www.law.uchicago.edu. Retrieved 2017-02-27. This page was last edited on 2 April 2019, at 18:08 (UTC).